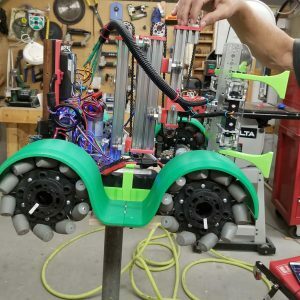 Mecanum Drive- We used mecanum wheels last year and we fell in love with them. They allow us to maneuver with extreme precision while still allowing us all the perks of normal wheels. However, this year we changed things up a little. We increased the diameter of the wheel to 6 inches, for more ease with getting on the balance boards, which brings more change than you would expect. Movement – with the mecanum wheels comes extreme precision movement. This robot can move in all directions, forwards, backwards, sideways, diagonal, and in perfect circles. It lets us get where we need to go fast and efficiently. Final Words – the wheels we used this year let us have great movement and the ability to do what we need to do efficiently.